I live in the Rocky Mountains. Several years ago I was working at a newspaper as a reporter/illustrator and I fell in love with the editor. He proposed and we got married. Now I have a cow dog named Annie (corgi/blue healer - short but scrappy) who keeps the range cows out of the garden, and a brave kitty named Marla Mayhem (grey-tiger stripes) who chases squirrels with Annie. After leaving the news business I had been working as a waitress in a nearby resort but decided to quit that job and put all my energy into scrapbook designing. Kisses and hugs to all my customers for allowing me to do that. My office is an upstairs room accessible only by a rope. When I want to be alone I pull up the rope, close the trap door and it becomes my fortress of solitude. There I listen to tunes (Muppet Central Radio, Love Baby Indie, Ren Radio, and Kitsch but Chic) nibble chocolates, and sketch a lot. I scan the sketches and give them to Tim to extract. Then I texture them in Painter II and touch them up in Photoshop. Photos go through the same process. I will usually start out with a sort of specific kit in mind but it almost always becomes something very different. My Creative Team knows this. 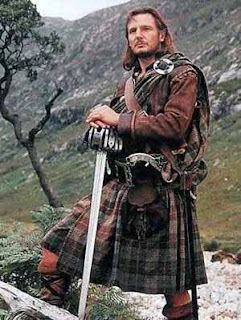 A couple winters ago I told them I was working on something dark - a Rapunzil kit with a prince that looked like George Clooney (possibly in a kilt). 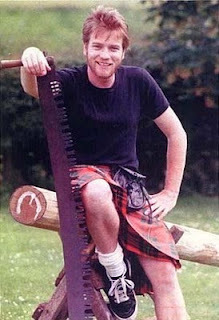 (Carinspixels posted many of her favorite hunks-in-kilts pictures in our CT Lounge.) It ended up being Greymouse Manor - a mouse party in a magical castle, with a baron that looks sort of like Stuart Little (with no kilt - or, for that matter, pants.) But it’s one of my favorites. The moral here is: I’m sorry but you can’t depend on anything I say. Thank you so very much for visiting my blog. Here's an interview I did when I was at SBG in 2012 if you would like to learn a little more about me and how I once was on the run from the law.